Search Engine Optimization (SEO) was the commission: Cirv continues to create unique plans that puts Monster Fuses placed very well in their market. Monster Fuses is on the first pages for virtually every one of their thousands of products, giving them a leading edge over the competition. Cirv developed a website that featured current design requirements and included a search engine. Cirv built technology to automatically display results for different fuse measurements for fuses in stock. Monster Fuses has used Cirv Inc. since our beginning in 2001. Cirv delivered our new website on schedule and on budget. Their graphic design captured the essence of our business, and the new search engine is already creating sales. Our clients are now calling us to verify their own search results. We are hear you show 12 pieces in inventory, can you ship this afternoon? everyday. The new search engine’s flexibility provides us with a long-desired product cross-reference, and it will be the basis for all of our planned inventory control programs this year. Cirv offers Monster Fuses periodic search engine optimization SEO plans that are phased into their company. Once a phase is done we sit down and implement new plans to help drive Monster Fuses growth. A company who has developed itself as a used fuse leader. 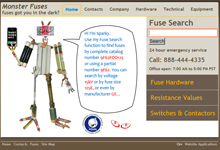 They are known as the company to go to if you need to replace any size of fuse. They provide fast, knowledgeable and courteous service, 24/7. They are extremely customer focused and are a resource to meet many fuse demands.